Alongside the Xperia Z3, Sony released the miniature version of its 2014 flagship, the Xperia Z3 Compact. The Z3 Compact is unique amongst smaller Android smartphones because it packs basically the same internal specs as the full-sized flagship. But how can the Z3 Compact can be considered a flagship in its own right and where does it struggle? We'll show you in our Xperia Z3 Compact review. The Xperia Z3 Compact follows Sony's unmistakable "OmniBalance" design language although this time with a little twist: the metallic-look edges have been replaced with a frosted glass look which gives more grip than the slippery smooth plastic of the Xperia Z1 Compact. The Xperia Z3 Compact release date put it in the US market in mid-October but without carrier branding and in the UK in mid-August. The speakers shift to the bottom edge and there's the usual silver power button, volume rocker, physical camera shutter button, magnetic dock connector and water tight plastic flaps over the microSD, micro-USB and nano-SIM card slots. The edges of the Z3 Compact are interesting: because the plastic is see-through, there's a nice concave/convex thing going on, where the edges look to curve inwards while they actually curve outwards. The front and back of the device are, as usual, nice slabs of glass. Of course, the Z3 Compact is smaller and lighter than the Xperia Z3, but also a bit thicker – therefore it does not look quite as slim and elegant as its big branch. 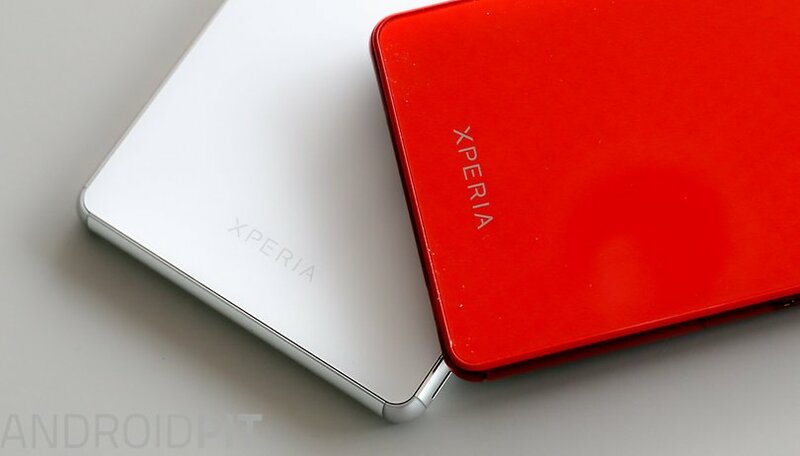 It is, however, the same size as its predecessor, the Z1 Compact but is about 10 percent thinner and lighter than Sony's previous compact offering. The display of the Z3 Compact measures 4.6 inches which, considering the fact it has the best specs in its class in Android, sets it up as the prime Android competitor for the similarly sized Apple iPhone. The Z3 Compact has clearly been designed as the perfect balance between the ''too-large'' 5.5-inch flagships and other mid-sized devices with seriously watered-down specs. The maximum brightness of the HD display is slightly lower compared to the Z3, as is the pixel density – its 1280 x 720 pixel resolution produces 319 pixels per inch compared to the Z3's 424 ppi and the Z1 Compact's 342 ppi. The display is still sharp though, and Sony's "X-Reality for mobile" image enhancement improves the display of images and videos in terms of sharpness and color representation significantly. The color tone can also be adjusted manually in the settings. The Z3 Compact features, like other Xperia Z series devices, begins with water and dust protection to IP68 certification. This means it can withstand up to 30 minutes in fresh water without damage, as long as it does not dive deeper than 1.5 meters. In combination with the separate camera button, the Z3 Compact works quite nicely as an underwater camera and is a great phone for the outdoors as there is no need to concern yourself with rain or dust. The plastic border on the Z3 Compact also provides a shock absorbing "bumper". The Xperia Z3 Compact comes with the latest version of Android, which is currently Android 4.4.4 KitKat, and an update to the new Android L release is certain. Sony's Xperia UI is identical on both the Z3 and the Z3 Compact, meaning that as far as software goes, you'll be getting the exact same experience as those using the full-sized Z3. In addition to the Sony suite of apps that bring added value – especially in multimedia applications (for example, the audio enhancements in the Walkman app) – Sony is also introducing PS4 Remote Play: an app that allows you to wirelessly connect to any game on your PS4 and play them from your Z3 Compact. There is also a new controller module that allows you to connect your Z3 Compact to a DualShock controller like an Nvidia Shield handheld gaming console. Sony has also improved its STAMINA Mode for better battery life. You also get an Ultra STAMINA Mode which will drop the screen to gray scale and only provide access to a few select apps to further prolong battery life. One weird observation: if you disable the mode, the device will completely restart – this somewhat less elegant and more time-consuming than similar modes on other smartphones. Sony also included the Life Log app, which, when the smartphone is connected to one of Sony's smartwatches like the new Smartwatch 3 or Lifeband Talk, tracks and monitors steps, stairs, distances travelled, sleep patterns, heart rate and more. The Z3 Compact packs the same processor as the Z3: a Snapdragon 801 clocked at 2.5 GHz, supported by 2 GB of RAM, a combination that is more than adequate for most tasks. During the test period, the Z3 Compact was almost always at its best and there were very few dropouts or delays. When snapping photos, things could have been a little faster though. This is about the only place where you will notice a clear gap between super-fast devices like the Galaxy S5 or the LG G3 and the Z3 Compact. In the AnTuTu benchmark test, the Z3 Compact always obtained scores between 42,000 and 44,000 points, which is equal to any competing major flagship right now. The Z3 Compact even outpaced the HTC One (M8) on several occasions. The Z3 Compact has the same high resolution camera as the Z3: 20.7 MP in 4: 3 format and 15.5 MP in 16: 9 format. In this respect the Z3 Compact approaches the Galaxy S5's 16 MP shooter, but it soon becomes clear that the high resolution in the Z3 Compact comes with some limitations. The HDR function, for example, can not be activated in the higher resolution shooting modes – the feature is only supported at 8 MP or less. Also, Sweep Panorama pictures can not be completed at any point – if you stop the recording earlier than the Z3 Compact wants you to, you'll get an ugly black bar on the right edge of your panorama. Other than these peculiarities, the camera app offers good functionality and some innovative features such as post-processing of focal point and background blur are on-board just as we saw with the Xperia Z2. The picture quality is generally good, but again there are a few limitations: HDR images appear a little pale and grayish, and while in normal mode the images have pretty high contrast, in low light the software has to work a little too hard to suppress image noise in dark areas and doesn't do such a great job. Overall, the Z3 Compact has a good camera, but it is not quite up to par compared to other flagships like the Galaxy S5. The Z3 Compact has a 2,600 mAh battery, which is quite good for a smaller screened smartphone, especially when you consider that the Galaxy S4 has the same sized battery but with a larger display and higher resolution. In our test, the Z3 Compact's battery proved to be above average, lasting more than a day with connections to both Wi-Fi and mobile networks, with background syncing for multiple Google accounts, some test photos, a few app downloads, multiple AnTuTu benchmark tests and the display at maximum brightness. By utilizing the various power saving modes, the Z3 Compact's run time can also be extended - depending on the mode you choose the estimated remaining time is displayed for you, but this information is not very reliable and will of course change depending on your style of usage. But if STAMINA Mode promises a battery saving run time of two days, you're likely to get it when you consider that it's entirely possible to make it a day and a half just normally. In the UK, the Xperia Z3 Compact is available SIM-free on Sony's Mobile Store for 429 GBP or Pay As You Go for 349 GBP, via Clove for 349 GBP, on Handtec for 348 GBP and for 350 GBP on Amazon. You can pick up an unlocked international version (16 GB) for 513.87 USD on Amazon, or you can pick up a SIM-free Xperia Z3 via Sony's Mobile Store in the US for 529.99 USD. There are no carrier-branded Z3 Compact deals in the US. Once again, Sony has shown the competition that it is indeed possible to create a mini flagship that is (almost) every bit as good as the full-sized version. As we've mentioned previously, this is why Sony avoids the term ''mini'' and instead opts for ''compact,'' which implies the same thing just in a smaller housing. Technically the Z3 Compact is fantastic and despite the occasional issue like with the camera – which we have also experienced on the Z2 and Z3 – you'd be hard pressed to find a better Android in 4.6-inch range.